CES, an annual convention held in Las Vegas, is arguably the biggest tech event of the year. Besides offering a sprawling platform for developers to showcase their very latest and greatest, it also tells us what to expect from new consumer products – anything from AI to wearable tech – over the next 12 months. There are countless articles strewn across the web on this year's show but we’re going to take a closer look at a handful of (in our humble opinion) truly stand-out televisions. We’ll start with our personal favourite: Samsung’s range of QLED TVs. Despite them entirely skipping the OLED stage (and with some noted determination), the Q7, Q8 and Q9 Series is nothing short of breathtaking. You’d be right in thinking it has something to do with OLED; the two are somewhat similar in anatomy. 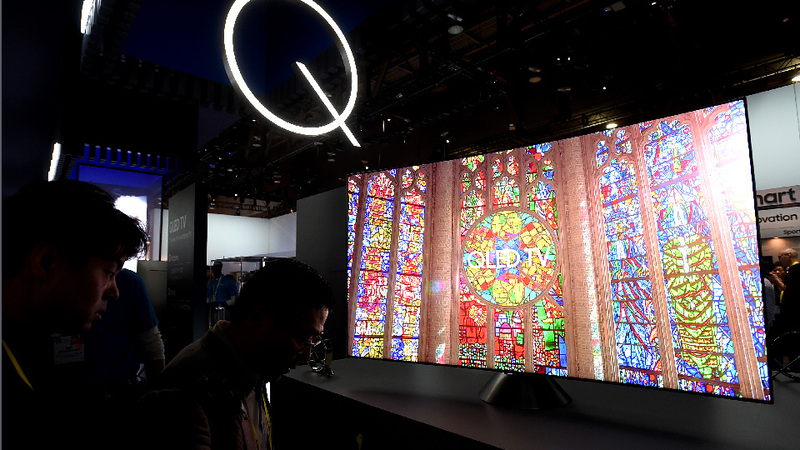 The primary difference, however, is that QLED – which actually stands for Quantum Dot Light Emitting Diode (but I guess QDLED isn’t quite as snappy) – is backlit. We hear your shouts of ‘glorified LCD’, but take a minute to appreciate just how clever the technology is. As an evolution of Quantum Dot technology (showcased on last year’s models), these TVs take a Quantum Dot layer and wrap it in a new metal alloy. This creates more accurate, vivid colours, improves on viewing angles and makes brightness levels even better. Samsung reports QLED can achieve up to 1,500-2,000 nits of brightness – dwarfing the latest OLED’s puny brightness levels of ‘just’ 800 nits – while delivering 100% of the DCI-P3 colour space for impressive saturation maintenance. Of course, how the screen looks turned off is also important and, as always, Samsung has packaged this new tech in a seductively futuristic design. Set into an elegantly slender panel and propped up by a choice of two equally stylish stands – you’re given the choice of a minimalist cone or an easel-type tripod – expect to see QLED TVs popping up on must-have lists throughout the year. Holding their own in the OLED corner is rival tech giant LG who come a very, very close second. Their flagship W7 OLED TV is nothing short of extraordinary; at just 2.5mm thick, it’s thinner than any phone you would realistically like to own and is designed to sit flush against the wall, giving the effect of 4K wallpaper. LG has confirmed that it’ll be available later in the year in 65” and 77” screen sizes, coming complete with a separate 4.2 Dolby Atmos soundbar and media box stuffed with everything that powers the phenomenal panel, all of which is connected through one discreet strip cable. Although OLED technology is nothing new, they’ve souped-up the W7’s specs. A 25% increase in brightness levels and support for new HDR standards – HLG and one from Technicolour have been added to the existing HDR10 and Dolby Visions – keeps LG, as ever, vying for the top TV spot. 2017 will also see LG release four other OLEDs, 2 of which were displayed at this year’s CES. The E7 and G7 models are pretty much straight swaps for the current E6 and G6 while the B7 and C7, due to a lower spec sound set-up, offer a more affordable option for those that prefer to run their audio through an independent speaker system. However, these smaller screens all adopt the W’s incredible panel and support Dolby Atmos, making them a worthy investment. Sony has finally joined the OLED ranks with their superb Bravia A1 Series. Set to be released in 65” and 77” screen sizes, the A1 Series boasts Dolby Vision HDR tech support and features Sony’s remarkable X1 Extreme picture processor, which was the talking point of the last year’s Z9D. Let’s face it, though, CES is riddled with impressive screens. What sets Sony’s Bravia apart is its truly unique audio or, more specifically, where it comes from. It features no speakers because, extraordinarily, the panel itself is the speaker; it vibrates to create a stereo effect while a cunningly concealed subwoofer in the desk stand (so, not entirely from the panel) provides satisfying bass. We're yet to see if it takes off on the consumer market but for now, we’re thoroughly impressed. Panasonic is another contender that made some bold claims – yet to be proved entirely valid - at this year’s convention. Their EZ1002, another OLED panel, reportedly produces nearly double the brightness of a common-or-garden OLED for peak HDR. However, it was also hailed as the first HDR-capable Ultra HD TV in its press release which isn’t strictly true. It does have a selection of other interesting features, though, like the Absolute Black Filter (no prizes for guessing what that does) for 'record-setting' true blacks while HDR10 and full DCI colour support ensure it’s at least future-proofed against new high-dynamic range options. Audio also looks promising, with a ‘dynamic blade’ speaker tuned by Technics for cinematic sound to match the proclaimed picture quality. The 65” EZ1002 can be expected in shops from June onwards but, judging from where LG has positioned themselves price-wise, we doubt it'll be a budget option. So, that’s about it for our top-rated TVs of CES 2017; some intriguing ideas, ingenious solutions and exceptional leaps in home entertainment. We can’t wait to put these latest models to the test but in the meantime, why not take a look at some existing TV reviews over on our YouTube channel? 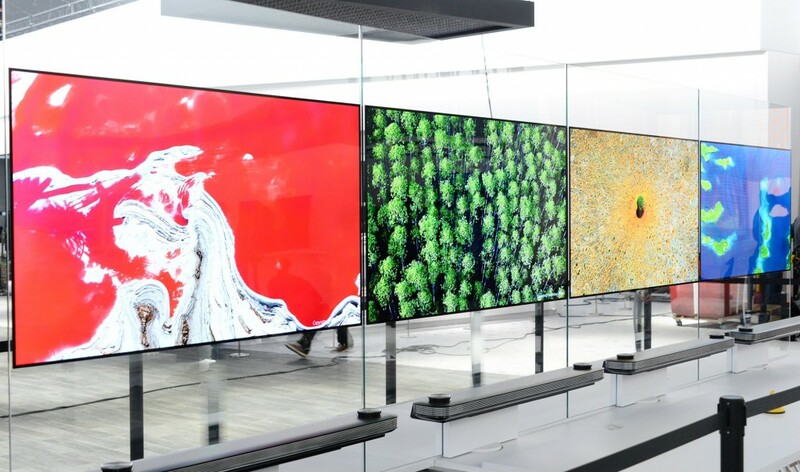 Or, if you want to peruse superb OLED TVs available to buy right now, take a look here.